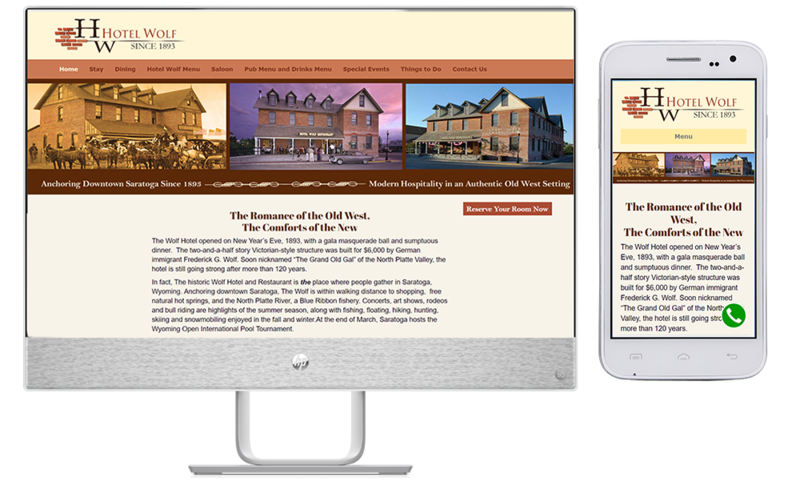 The Hotel Wolf is the anchor for downtown Saratoga, Wyoming, but its old site didn't really tell the hotel's story with any gusto. It's a historic landmark with period furniture, fine dining, and a Western saloon complete with swinging doors. The proprietors and staff are warm and welcoming. The vintage of the hotel demanded a site built in sepia and warm tones. Using keyworded copy and new photos, we built a a site that is both fun to visit and highly informational. We also updated their reservations page and added more images of their rooms, so guests can easily see the accommodations. Downloadable dining and beverage menus help entice travelers to enjoy the food and drink, as well as spend the night.